Today we’d like to introduce you to Meg Alexander. Meg, please share your story with us. How did you get to where you are today? The work that I do today, primarily drawing and sculpture, is an extension of my childhood love of playing outside, in the woods near my house. I would carve objects out of sticks, make bows and arrows, and collect berries from the bushes around my house, which I would crush and mix with water to make ink. I would peel the sheet-like membranes of inner bark from chunks of pine bark to create “paper”. I would steep the berry mixture and dry the bark sheets for several days, then I’d create a “pen” from a sharpened twig and write and draw on the sheets. This is very much how my art-making process and studio life feel to me today–craft and process oriented but based on mark making. Later, in high school, I had a wonderful drawing teacher who drew in a surrealist style–realistically unreal. I remember being fascinated by the precision of her drawing and thinking that drawing was some sort of super-power that I would like to acquire, so I practiced and developed my drawing skill over the years. I attended the Rhode Island School of Design after high school and continued to draw intensively. After working as a graphic designer for a few years after college, I attended the School of the Museum of Fine Arts in Boston, where I was able to explore sculpture in tandem with drawing. I’ve have maintained a studio in the Boston area and exhibited my work ever since. Recently I’ve had the opportunity to do some large-scale commission work, and that’s been challenging and exciting. 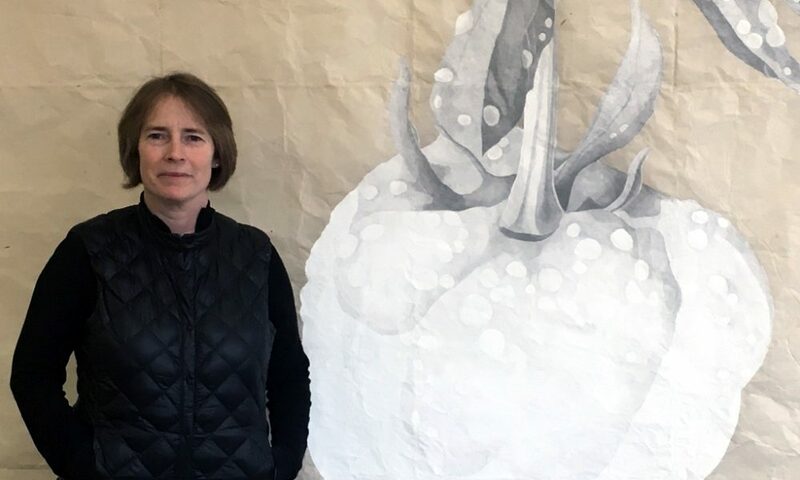 I’ve always prioritized my artwork and with the support of my husband and daughters I’ve managed to continue my studio practice over many years. That’s always been my goal. Has it always been easy? No. Struggle? Sometimes. Living a creative life is a struggle. Creating art is a struggle. Believing in yourself is a struggle. Connecting with gallerists and collectors is a struggle. Supporting a studio is a struggle. I’ve been fortunate to find venues to exhibit my work consistently and my work has been placed in some wonderful collections. As a studio artist, I develop and pursue projects that feel relevant to me. I create images and objects that are inspired by natural forms and systems. My drawing projects are rooted in close looking at the objects or fields that are my subjects. My work is characterized by a methodical, almost scientific, process. I tend to work on an image over months or years, using drafts, sketches, studies and variations to figure out what I’m doing. Although I approach my work in a cool, analytical way, in the end, I want the work to have a timeless, emotional quality. I’d say this focused, labor- and time-intensive process gives my work its character. I love Boston! It is beautiful, diverse, walkable, intellectual, and accessible. For a city its size, it has a vital and vibrant arts scene anchored by the many fantastic art schools and university programs in the area. The schools produce artists, and university art galleries and museums provide a non-commercial, critical platform for exhibiting work, as well as for hosting talks and symposia. Our museums have vital contemporary-art programming and offer access to every historical period of art and culture. The ICA, the MFA, the Peabody Essex Museum, the List at MIT, the Rose at Brandeis, the Harvard Art Museums, Mass Art’s galleries, Tufts/Museum School galleries, etc…we are very well fed! Our commercial gallery scene seems to ebb and flow. It’s discouraging to see long-established galleries in the South End closing or abandoning their brick-and-mortar presence. Boston is not known for having a strong collector base. Artwork sales seem to happen more and more online but there is no substitute for experiencing work in person. New commercial galleries are opening, though, so there is hope. And there are a few interesting artist-run spaces that provide alternative platforms. Artists will always find ways to show their work “live” because the need to create exhibitions and connect directly with viewers is an essential aspect of art making.